​There is one thing that never fades over time… the call to be thankful, to be filled with gratitude. Harvest time is a time to give thanks, not only for the farmer and his family, but those whose wants and needs will be supplied through the cold winter months that lie ahead. Growing up in an agricultural community, we were surrounded by farmers who counted on good weather and God’s favor to bring their crops in. As a child, I worked in the fields picking strawberries and raspberries, both summer crops, but I remember the satisfaction mixed with relief as the fruit was harvested. It truly is a time of celebration when the crops are brought in – be it fruits, vegetables or hay to feed the livestock. November is a month of thanksgiving, not only as we celebrate Thanksgiving Day, but also as we witness the beautiful pallet of fall colors that will soon fall prey to winter’s frigid embrace. Soon we, too, will be snuggled in our homes just like the harvest in the storehouses. This hymn was originally written in 1844 by George Alford, who was the rector of Aston Standford church in Buckinghamshire, England. The first version had seven verses and was revised in 1865 to only four verses. It later gained popularity in the United States where it was used in Thanksgiving celebrations. But in its multiple verses, it speaks not only of the harvest of crops but the “harvest” of souls when Jesus returns. 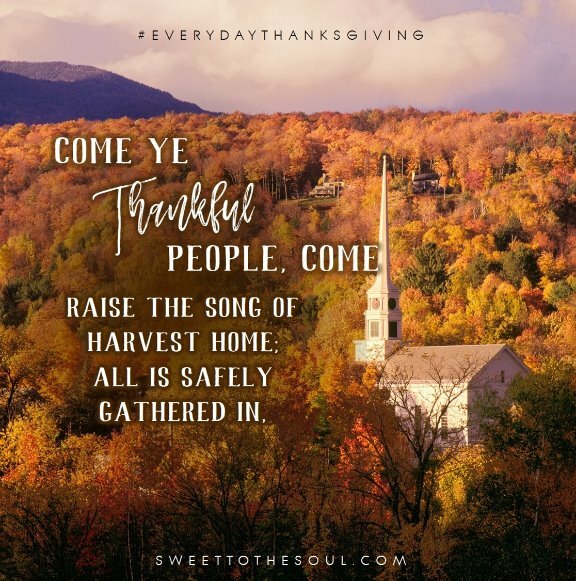 Come Ye Thankful People Come conveys the truth of scripture and a message of warning that just like seedtime and harvest, there will also be an accounting in God’s kingdom. In the final verse, it talks about the triumphant church. All be safely gathered in, Free from sorrow, free from sin, There, forever purified, In God's garner to abide. Heaven will be a place that is free from sorrow and free from sin. It is the hope of our bright future as Christians. Harvest time is coming, are you ready? Yes & Amen. Beautiful hymn, thank you Barbara!